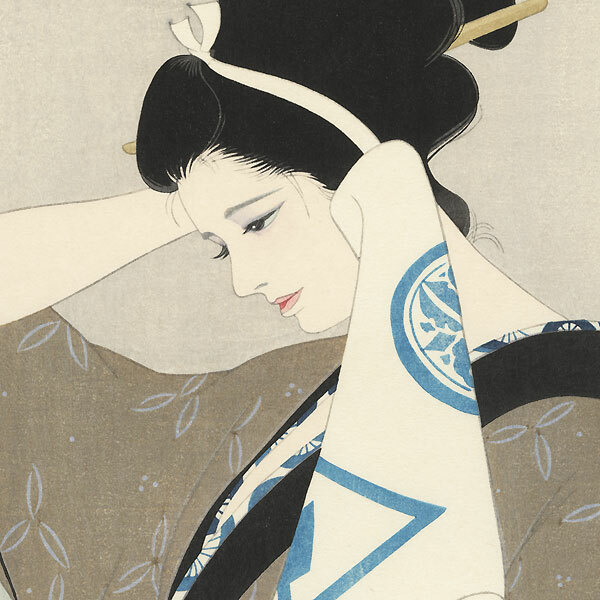 Shirabai - This lovely beauty portrait comes from series called "Shirabai" (White Plum), which the Asahi Newspaper Company distributed in 1976 shortly after Iwata Sentaro's death. A number of famous publishers collaborated on the series, including Watanabe, Kato Junji, and Adachi. Beautifully colored and printed, this limited edition series is rarely seen on the market. Iwata Sentaro - Born in Tokyo, Iwata Sentaro studied with the famous shin hanga artist Ito Shinsui, and is best known for his portraits of beautiful women done after WWII. 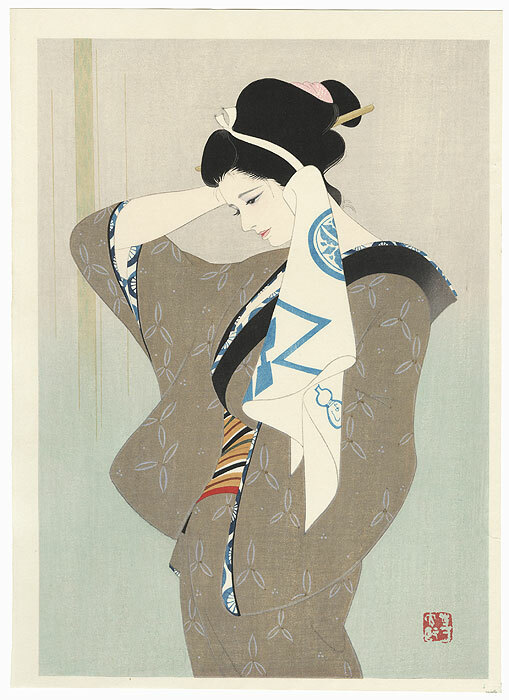 His attractive designs of contemporary beauties feature graceful flowing line work and striking compositions, creating a modern interpretation of the traditional Japanese bijin genre. 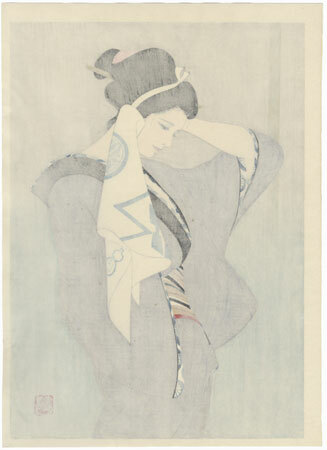 Many feature delicate bokashi shading, such as a soft pink flush on the cheeks or eyes, or subtle shadows along the neck to add depth and definition. Some are posed portraits, but others capture the women seemingly unaware during quiet, reflective moments, offering an intimate glimpse at their world. A great choice for a collector of contemporary woodblocks, these lovely prints would also make wonderful framed displays. Special detail - Soft bokashi shading on the background and black kimono collar. Condition - This print with excellent color and detail as shown. Slight creasing at edge. Please see photos for details. Good overall.